On April 29, Pope Benedict XVI held a special audience with Canada’s Assembly of First Nations National Chief Phil Fontaine and a delegation of First Nations Elders and former alumni of residential schools. The Canadian Catholic Church was also represented by Archbishop James Weisgerber of Winnipeg, President of the Episcopal Conference, and a delegation of missionary congregations involved in the residential schools. Fr. Timothy COONEN, the bursar of OMI Lacombe Province, represented the communities of men religious. During that encounter, according to Vatican news sources, the Holy Father expressed his “sorrow at the anguish caused by the deplorable conduct of some members of the church and offered his sympathy and prayerful solidarity.” According to the Vatican statement, the pope “emphasized that acts of abuse cannot be tolerated in society. 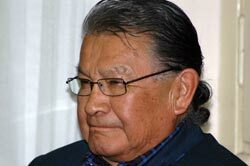 He prayed that all those affected would experience healing, and he encouraged First Nations peoples to continue to move forward with renewed hope.” Grand Chief Fontaine said group members “heard what we came for” and were “very happy” with the meeting and the response of Pope Benedict. As a gesture of friendship and respect, the Oblate Superior General, Fr. Wilhelm STECKLING, invited Chief Fontaine, his entourage, and other guests to a private reception and dinner at the General House on April 30. Among the guests was Archbishop Gerard Pettipas, CSsR, of Grouard-McLennan and Canada’s ambassador to the Holy See, Anne Leahy. By this simple act of breaking bread together, Fr. General hopes to forge a renewed relationship between the Oblates and the indigenous peoples of Canada after the difficult years of working out a just settlement for the troubling events that took place for many decades in the residential schools set up by the Canadian government and administered by Oblates and other church groups.